Author BoxMySpacePosted on December 16, 2015 Categories Architecture, Art, Decor, DIY, Feng shui, Furnishing, lifestyle, Mumbai, Perception, RemodelTags Bathroom, Bedroom, blog, Blogs, Home, KitchenLeave a comment on Make space Feng Shui style! You knew this day was coming, and now it is a bittersweet moment. It 8 AM and your house is finally empty after 35 years. The kids have moved abroad to study and almost settled comfortably. You’ve the whole house to yourself and your significant other. Instead, flip your house and include a walk-in closet, extra bathroom, or dedicated crafting space. Since your kids have moved out, here’s your opportunity to turn it into an extra room for all your dresses, expensive shoes, and maybe a vanity table for your everyday make-up essentials. Sort of like a walk-in wardrobe. When you’re remodeling your house, many people feel it will cost a lot of money. In fact, it is the opposite and you end up saving money. 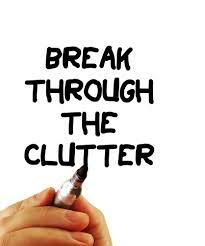 Make a list of what you want in the new and remodeled room. Remember, less truly is more. 3. Ask before you dispose of. Before you decide to go ahead with remodeling of the room, sit down with your kids and note down the things they want to do away with. If you just fling out everything, it feels like you’re violating their space. Tread lightly! As we said before, you don’t need a lot of cash to change up the look of a room. For e.g. store away all the memorabilia in the living room and use that space for some wall hangings or other craft based products. It will most definitely add a spark to the room. Simple yet effective! Yes, very much so! It is never too late to pick up a hobby and pursue it. It could range from painting, to gardening and could go all the way to knitting. This might come in handy when you become a grandparent & knit a cute bed sheet for the little tyke. It also doubles up as a great boost to get over the empty nest syndrome. Now with your kids away, your chore list has been drastically halved. You no longer are doing laundry for the entire family or running around doing other errands. So flip your spare room and install the equipment and decorative lamps to create a calorie-burning room of your very own. With the increasing number of startups nowadays, many people have now turned their spare bedroom into tiny and functional office spaces. Also if you plan to sell your house post retirement for a tiny one, an office place at home adds more value on the selling price. Sometimes the best thing is to leave the room as is. It will be like a cherished memory for you as a parent. You never know when your grandchild would love to spend her holidays. She would love a cozy room that your kid lived in. Maybe you could just store certain items in boxes and place it under the bed. There are so many other exciting ways to restore your empty house. And if you’re still looking for more space at home, box it, seal it and store it away, temporarily. Regardless of the size of your house or apartment, we as individuals have two priorities in life i.e. save a good chunk of money and use minimum space while designing your picture perfect home. As rooms are getting smaller by the day, creating multipurpose rooms will help you live a clutter less life. Here are some of the easy-to-do and rather practical ideas that do not need a remodel overhaul. 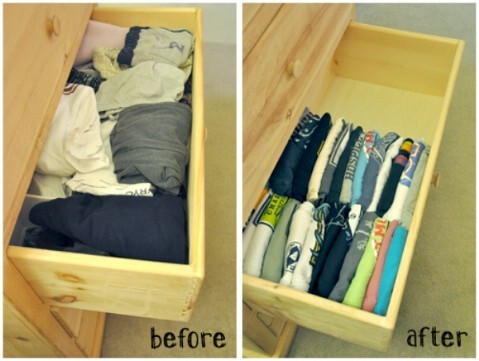 Did you know that there’s a right way to fold your clothes that gives you maximum space in your drawers? Try arranging your clothes horizontally way rather than a vertical stack, you will find more space than you bargained for. 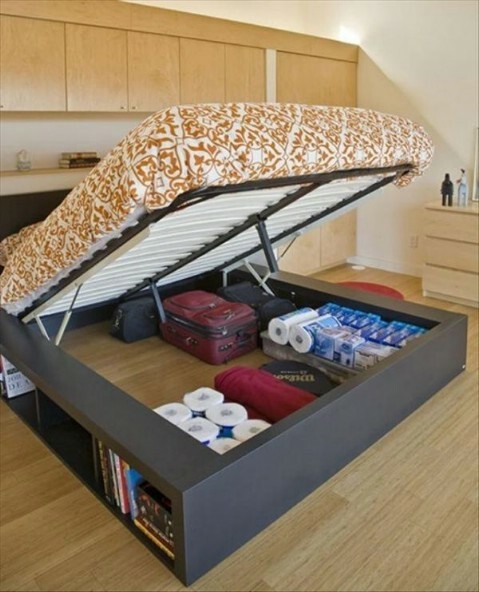 This is indeed a great space saver. Simply install sliding doors wherever you can as they require less space that swinging doors and are cost effective too. Now-a-days the space available under your bed is a great place to store all your seasonal clothes and thick blankets for when you need them. For a small apartment with limited space in terms of closets. We all have those old metal hangers that you want to dispose of. Wait, before you do, they are still are of great use. 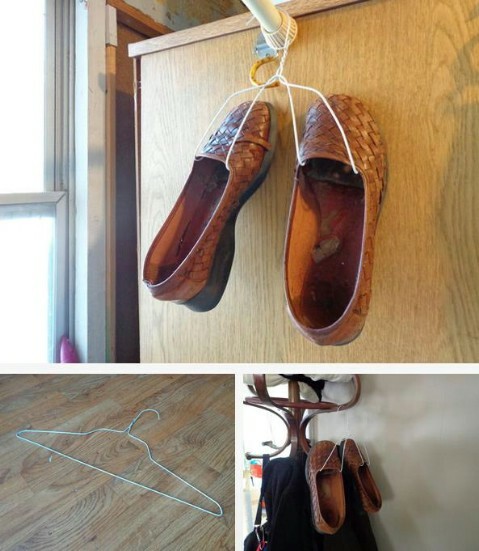 You just bend the hanger to create a hook so that your shoes will stick on the ends and then hang them in the closet or wherever convenient. At times, people design kitchens in mono tones or may add a bit of highlight. It can drive away your appetite and can be unwelcoming to a point. 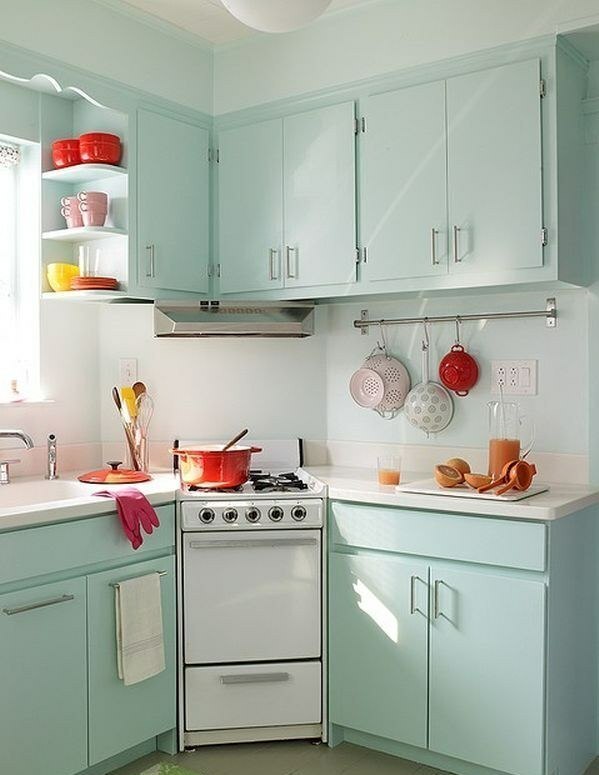 Add a pop of colour to your bland kitchen spaces with bright pots and pans. This will bring variety in your kitchen cabinets which can go a long way. 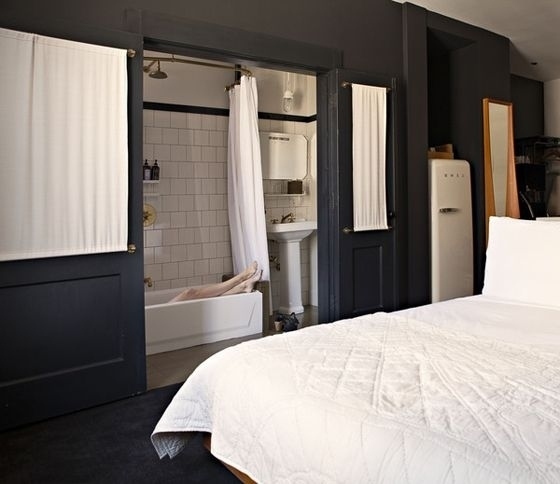 Every inch in your small apartment can come to use and add an angle to your room. 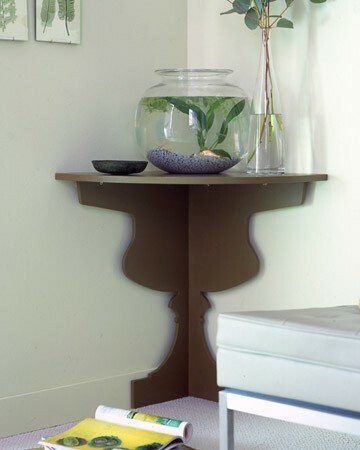 Like this one – where a single shelf that fits perfectly into the corner of a room can display so much more. So go ahead, we only have touched the creative surface, there is so much more you can do and innovate to make your house stand out and have #FunWithSpaces. Just because your house is small doesn’t mean you can’t live large, isn’t it? 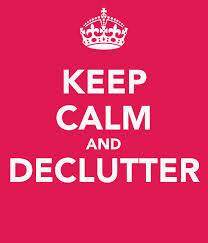 But if you’re still looking for store away your items, you can always “box them”, if you know what we mean!